When they met up in Virginia, MN in 1923, singer Michael Cassius Dean told song collector Franz Rickaby that he learned this song while himself working as a “shanty boy” (lumberjack) in Michigan around 1878. “Stronertown,” Dean said, was at the head of the Manistee River, six miles up from Manistee, Michigan. I find a Stronach, MI on modern maps that is likely the spot. 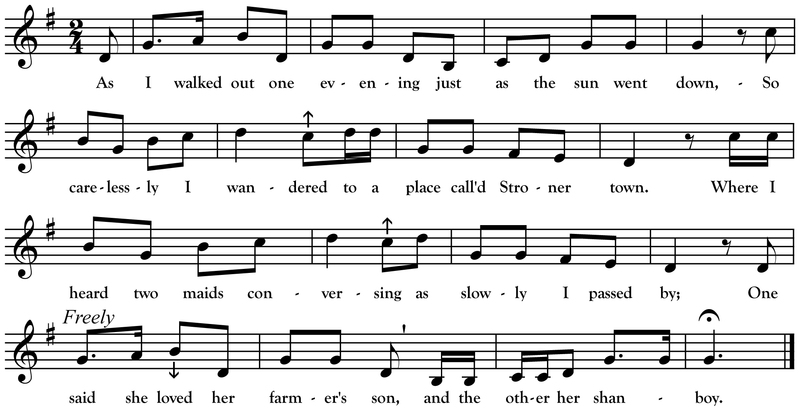 The song is often called “The Shanty Boy and the Farmer’s Son” and it appears frequently in song collections made throughout the lumbering regions of the Great Lakes and Maritimes. It even managed the rare trip east across the Atlantic where it was collected in County Antrim by Sam Henry in 1936. I transcribed the above melody from the 1924 recording of Dean made by Robert Winslow Gordon. Another, slightly different, version was transcribed by Rickaby in 1923 from the singing of Ed “Arkansaw” Springstead in my hometown Bemidji, MN. This text belongs to a family of similar dialogue songs and poems that date back centuries in England, Scotland and Ireland. Its direct “parent” song may be “I Love My Sailor Boy” which also appears in Dean’s songster The Flying Cloud (my source for the above text). Shanty-boys sang at least a few songs poking fun at sober, boring farmers who, they assured themselves, were sadly lacking in the manly mystique personified by the men chopping down trees and heroically rafting them downriver to the sawmill.